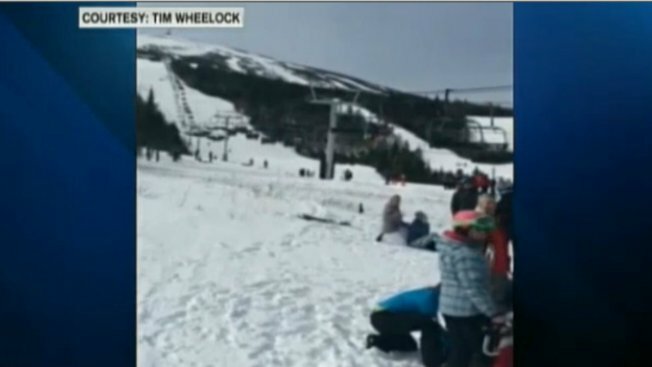 A lift evacuation at Sugarloaf Mountain in Maine on March 21, 2015. Sugarloaf is spending $800,000 to replace a chair lift that began moving backward last winter, injuring seven skiers. Investigators say a gear box failure allowed the King Pine lift to move in reverse last March and that it failed to stop immediately because of design flaw. Some frightened skiers jumped. Sugarloaf says the new Doppelmayr lift will feature a redesigned gear box and the latest anti-rollback technology. Sugarloaf General Manager Karl Strand said Thursday that the existing towers and chairs will be utilized "but King Pine will, in essence, be a completely new lift." Sugarloaf is spending another $500,000 to upgrade six other lifts. That'll include upgraded brakes and anti-rollback technology on five of them: Timberline, West Mountain, Skidway, Sawduster, and Snubber.